Many women don’t recognize the warning signs of coronary heart disease (CHD) until their health—and their lives—are in jeopardy. According to the American Heart Association (AHA), coronary heart disease is the single leading cause of death for American women. In fact, nearly twice as many women die from heart attack, stroke and other coronary heart diseases than of all forms of cancer combined, including breast cancer. And in each year since 1984, more women have died of cardiovascular diseases than men. Coronary heart disease, also known as coronary artery disease (CAD) and ischemic heart disease, is a disease of the heart’s blood vessels that, if untreated, can cause heart attacks. Like any muscle, the heart needs a constant supply of oxygen and nutrients that are carried to it by the blood in the coronary arteries. When the coronary arteries become narrowed or clogged and cannot supply enough blood to the heart, the result is CHD. Heart attack and stroke are common results of conditions that restrict or stop the blood flow to the heart or brain. At any given age, men have a greater risk of heart attack than women, but women are only half as likely as men to survive a heart attack and more likely to have a second attack. In addition, about 60 percent of stroke deaths occur in women. According to the AHA, each year, about 55,000 more women than men have strokes. African-American women are more likely to die of CHD than Caucasian women, perhaps because they are more likely to have more risk factors, including high blood pressure (hypertension), diabetes, obesity and smoking, and are more likely to receive poorer health care than Caucasian women. For example, in 2005, the overall CHD death rate (per 100,000 women) was 298.2 for black women compared to 215.5 for white women. Heart disease risk is also higher among Mexican Americans, Native Americans and native Hawaiians. This may be partly due to higher rates of obesity and diabetes in these groups. Coronary heart disease is initially diagnosed by patient history and physical examination. EKGblood tests, and tests to image the arteries and heart muscle confirm the diagnosis. When one or more coronary arteries narrow, it may make it difficult for adequate blood to reach the heart, especially during exercise. This can cause the heart muscle to ache like any other muscle in the body. Should the arteries continue to narrow, it may take less activity to stress the heart and provoke symptoms. 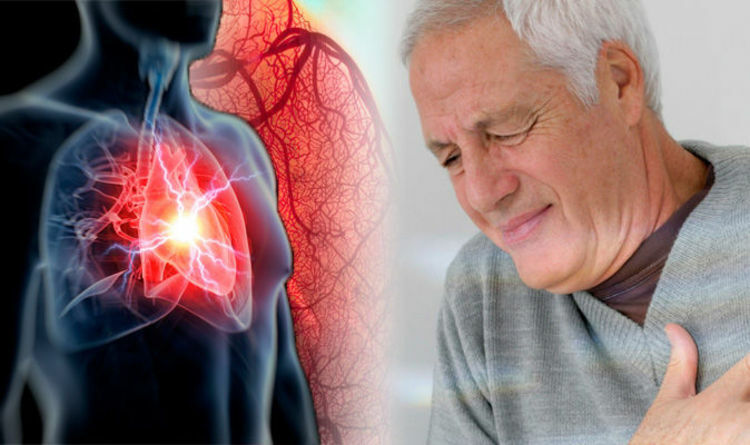 The classic symptoms of chest pain or pressure and shortness of breath that often spreads to the shoulders, arms, and/or neck due to atherosclerotic heart disease (ASHD) or coronary artery disease (CAD) are called angina. Should one of the coronary arteries become completely blocked — usually due to a plaque that ruptures and causes a blood clot to form — blood supply to part of the heart may be lost. This causes a piece of heart muscle to die. This is called a heart attack or myocardial infarction (myo=muscle + cardia=heart + infarction= tissue death). the affected part of the muscle cannot be revived. It dies and is replaced by scar tissue. Long term, this scar tissue decreases the heart’s ability to pump effectively and efficiently and may lead to ischemic cardiomyopathy (ischemic=decreased blood supply + cardio=heart + myo=muscle + pathy=disease). The diagnosis of cardiovascular disease begins by taking the patient’s history. The health-care professional needs to understand the patient’s symptoms and this may be difficult. Often, health-care professionals ask about chest pain, but the patient may deny having pain because they perceive their symptoms as pressure or heaviness. Words also may have different meanings for different people. The patient may describe their discomfort as sharp, meaning intense, while the health-care professional may understand that term to mean stabbing. For that reason, it is important for the patient to be allowed to take the time to describe the symptoms in their own words and have the health-care professional try to clarify the terms being used. A normal EKG does not exclude cardiovascular disease and coronary artery blockage; there may be narrowing of the coronary arteries that has yet to cause heart muscle damage. An abnormal EKG may be a “normal” variant for that patient and the result has to be interpreted based upon the patient’s circumstances. A radioactive tracer that is injected into a vein can be used to indirectly assess blood flow to the heart. Technetium or thallium can be injected while a radioactive counter is used to map out how heart muscle cells absorb the radioactive chemical and how it is distributed in heart muscle cells may help determine indirectly whether a blockage exists. An area of the heart with no uptake would suggest that the area is not getting enough blood supply. This test may also be combined with an exercise test. Cardiac computerized tomography (CT) and magnetic resonance imaging (MRI). Using these scans, the anatomy of the coronary arteries can be evaluated, including how much calcium is present in the artery walls and whether blockage or artery narrowing are present. Each test has its benefits and limitations and the risks and benefits of considering a CT or MRI depends upon a patient’s situation. With better understanding of the different signs and symptoms of heart disease, especially the “atypical” symptoms experienced by women and the elderly, the diagnosis of heart disease has improved. Patients with a history of heart attack, transient ischemic attack (TIA), or stroke, statins may be appropriate for patients with high LDL cholesterol levels (the “bad” cholesterol), for example, those who have type 2 diabetes, and those who have a 10-year risk of heart attack greater than 7.5%. You and your health-care professional may estimate risk by using the American Heart Association and American College of Cardiology’s ASCVD (Atherosclerotic Cardiovascular Disease) Risk Calculator. Primary care practitioners, including those in family medicine, internal medicine specialists and women’s health, often help make the initial diagnosis of heart disease and are able to manage stable patients who do not need invasive procedures or interventions. These providers are also work to help minimize potential risk factors for heart disease, so that it does not develop, or if it is already present, to minimize progression of the artery blockages. Coronary heart disease starts with atherosclerosis, a process in which fatty substances build up inside the walls of blood vessels. Blood components also stick on the surface inside vessel walls making the vessels narrower and eventually “hardened” and less flexible. The buildup, or “plaque,” may also break apart, which can further limit blood flow. The buildup and narrowing proceed gradually and result in decreasing blood flow, followed by CHD symptoms. When blood flows more slowly at the site of narrowing, it can become “sticky” and eventually form a clot. This blood clot can narrow the opening of the artery even further, which can reduce blood flow to the heart, leading to chest pain, or angina. If blood flow is nearly or completely blocked, a heart attack can occur, leading to the death of muscle cells in the heart. Because the cells cannot be replaced, the result is permanent heart damage. Each year, up to half a million American women suffer heart attacks, an all-too-frequent outcome of CHD. Your risk of developing heart disease increases as you grow older; however, a woman’s risk of heart disease develops over her entire lifetime. Scientists are still learning about the actions of estrogen on the body. In terms of the cardiovascular system, estrogen works to keep a woman’s arteries free from atherosclerotic plaque (the buildup of fatty substances, cholesterol, cellular waste and other material) partly by improving the ratio of LDL (low-density lipoprotein) and HDL (high-density lipoprotein) cholesterol. Estrogen increases the amount of HDL cholesterol, which helps clear LDL cholesterol from the bloodstream, the type of cholesterol that contributes to plaque buildup in the arteries. LDL cholesterol is a major cause of CHD, according to the National Cholesterol Education Program (NCEP) of the National Heart, Lung, and Blood Institute (NHLBI). Yet, research in women who started on hormone therapy an average of 10 years after menopause showed a slight increase in risk of heart attack and stroke. However, it is uncertain if taking supplemental estrogen early on after menopause can reduce your risk of cardiovascular events, and ongoing studies continue to evaluate the effect of hormone therapy on CHD. Smoking. Smoking accelerates the development of atherosclerosis by constricting blood vessels, accelerating the formation of blood clots and restricting the amount of oxygen the blood supplies. Smokers who have heart attacks and strokes are more likely to die from them. HDL cholesterol: above 60 mg/dL. This range is considered to be protective against heart disease, while levels less than 50 mg/dL for women or 40 mg/dL for men are considered a major risk factor for developing heart disease. High blood pressure (hypertension). When the heart works too hard to pump blood through the body, the intensity can damage the walls of the arteries of the heart and body.How is Blood Pressure Measured?A blood pressure reading records a systolic blood pressure, the highest pressure measured when the heart contracts with each beat, and a diastolic blood pressure, This designation means you have a significant risk of developing hypertension. Hypertension—high blood pressure—is defined as systolic pressure of 140 mm Hg or higher and/or diastolic pressure of 90 mm Hg or higher. It is further classified as stage 1 hypertension, from 140 to 159 systolic and/or 90 to 99 diastolic, and stage 2 hypertension, 160 or more systolic and 100 or more diastolic. For people with diabetes, high blood pressure is defined as systolic pressure of 130 or higher and/or diastolic pressure of 80 or higher.Experts now know that the systolic number is the most important when it comes to tracking blood pressure after age 50. Although both numbers increase with age, the diastolic number tends to level off or even fall after age 50. Diabetes. People with diabetes have death rates from heart disease that are two to three times those of adults without diabetes. In fact, cardiovascular disease is the leading cause of diabetes-related deaths. People with diabetes who have not yet had a heart attack have the same risk of future heart attack as someone with known coronary heart disease. Because their risk of heart attack is so high, NHLBI recommends that people with diabetes be treated aggressively with LDL-cholesterol lowering medication and carefully manage their blood sugar to reduce their cardiovascular risk. Inactivity. Not exercising contributes directly to heart-related problems and increases the likelihood that you’ll develop other risk factors, such as high blood pressure and diabetes. Homocysteine. Homocysteine is an amino acid normally found in the body. Some studies have suggested that high blood levels of this substance may increase the risk of heart disease, stroke and peripheral vascular disease. C-Reactive Protein (CRP), a high blood level of CRP, a sign of inflammation, may mean that the walls of the arteries in your heart are inflamed, which may raise your heart disease risk. Pregnancy complications. The updated 2011 AHA Guidelines for the Prevention of Cardiovascular Disease in Women added pregnancy complications such aspreeclampsia, gestational diabetes and pregnancy-induced hypertension as risk factors for cardiovascular disease in women. Systemic autoimmune diseases. The 2011 Guidelines also added systemic autoimmune diseases such as lupus and rheumatoid arthritis as risk factors for heart disease. A blood test called the high sensitivity C-reactive protein blood test (hs-CRP) is now widely available. Most studies show that in healthy people, the higher the hs-CRP levels, the higher the risk of developing a future heart attack. In fact, scientific studies have found that the risk for heart attack in people in the upper third of hs-CRP levels is twice that of those with hs-CRP levels in the lower third. Recent studies also found a link between hs-CRP, sudden cardiac death and peripheral arterial disease. According to the American Heart Association, numerous studies have examined whether hs-CRP can predict recurrent cardiovascular disease and stroke and death in various settings. High levels of hs-CRP consistently predict new coronary events in people with unstable angina and acute myocardial infarction (heart attack). Higher hs-CRP levels are also associated with lower survival rate in these people. Many studies suggested that after adjusting for other prognostic factors, hs-CRP was still useful as a risk predictor. It is not yet known whether specific interventions will benefit those who have high hs-CRP, however aspirin therapy and cholesterol-lowering drugs might be helpful in these individuals. Current guidelines from the American Heart Association and the U.S. Centers for Disease Control and Prevention recommend limiting the use of the CRP test as a discretionary tool for the evaluation of people at moderate risk and not as a means of screening the entire adult population because insufficient scientific evidence supports widespread use at this time. Postmenopausal status. Your risk of developing atherosclerosis and heart disease increases once you reach menopause. Prior to menopause, women are mainly protected from heart disease by estrogen, the reproductive hormone produced by theovaries. Among its many roles, estrogen helps keep arteries free from plaque by improving the ratio of LDL (low-density lipoprotein) and HDL (high-density lipoprotein) cholesterol. It also increases the amount of HDL cholesterol, which helps clear arteries of LDL cholesterol—the kind that most contributes to plaque build up. Angina. If clogged arteries prevent enough oxygen-carrying blood from reaching your heart, the heart may respond with pain called angina pectoris. Episodes of angina occur when the heart’s need for oxygen increases beyond the oxygen available from the blood nourishing the heart. Silent angina occurs when the same inadequate blood supply causes no symptoms. Microvascular angina occurs when the small vessels feeding the heart muscle are not functioning properly, most often due to fluctuations in vessel wall narrowing, in the absence of significant blockages in the major heart arteries.Physical exertion is the most common trigger for angina. Other triggers can be emotional stress, extreme cold or heat, heavy meals, alcohol and cigarette smoking. The pain is a pressing or squeezing pain, usually felt in the chest or sometimes in the shoulders, arms, neck, jaws or back.Angina suggests that coronary heart disease exists. People with angina have an increased risk of heart attack compared with those who have no symptoms. When the pattern of angina changes—if episodes become more frequent, last longer or occur without exercise—your risk of heart attack in subsequent days or weeks is much higher, and you should see your health care professional immediately.If you have angina, learn its pattern—what causes an angina attack, what it feels like, how long episodes usually last and whether medication relieves the attack. Angina is usually relieved in a few minutes by resting or taking prescribed angina medicine, such as nitroglycerin.Isolated episodes of angina seldom cause permanent damage to heart muscle; however, prolonged angina (more than 30 minutes) can signal a heart attack is occurring.Heart attack pain may be similar to angina, but the symptoms of angina quickly disappear with rest. Heart attack pain, however, usually persists despite resting or taking nitroglycerin and should be evaluated immediately. Like angina, heart attack pain can be a pressure or tightness in chest, arms, back or neck. Often symptoms include shortness of breath, sweating, nausea, vomiting or dizziness. A heart attack is an emergency. A delay in treatment could mean more of the heart muscle tissue is permanently damaged. If you think you’re having a heart attack, call 911. The dispatcher may tell you to chew aspirin at home, or you may receive aspirin therapy at the hospital. Silent ischemia. Sometimes atherosclerosis causes no symptoms. Silent ischemia is a condition caused by atherosclerosis, but isn’t associated with the chest pain or other symptoms common to other types of heart conditions. This condition occurs when arteries with atherosclerosis can’t deliver enough blood to the heart. An electrocardiogram (EKG or ECG), a measurement of electrical impulses produced by the heart, may indicate silent ischemia. However, without a heart checkup, a woman may never know that she has ischemia. This is why regular screening and checkups, particularly among women with heart disease risk factors such as diabetes, hypertension or a family history, are so important. People with diabetes are especially at risk for this condition because diabetes can cause nerve endings or “pain sensors” to be less sensitive, resulting in ischemia without accompanying pain. Keeping with you a list of all medications and how often you take each one. Also give a copy to a friend or family member who might be involved with your care if you’re taken to the hospital. This list provides valuable information to the emergency department staff. Keeping a small-sized copy of your most recent EKG in your wallet. Microvascular disease. Also known as cardiac syndrome X or small vessel disease, this is a disease of the finer blood vessels and is characterized by chest pain or ischemia without evidence of blockage in the large coronary arteries. Women are at higher risk than men for this condition. Microvascular disease may be caused when the small blood vessels in the heart don’t expand enough due to abnormalities in the function of the endothelium (the layer of cells lining blood vessels). Postmenopausal women and women who have had surgical menopause are at risk for experiencing symptoms of microvascular disease because their declining estrogen levels may affect the small blood vessels in their hearts.Because this condition is a small vessel disease, it can’t be seen on an angiogram(an X-ray with dye that identifies blockages in the larger blood vessels). Special imaging tests, such as PET scanning or MRI, may help with the diagnosis in the future. Today, however, microvascular disease is often a diagnosis of exclusion—meaning you may be diagnosed with this condition after tests provide no other cause for the chest pain. The same tests done to diagnose CAD, such as an EKG,echocardiogram or coronary angiogram, are usually used to diagnose microvascular disease. In addition, special chemical tests of the coronary blood vessels can be done at the time of the angiogram. Most women with microvascular disease have at least one risk factor for CHD, but it can occur in women who are otherwise healthy.Medications commonly used to treat CHD conditions may help to relieve pain caused by microvascular disease. Symptoms can be debilitating and new data suggests that if left untreated, women with microvascular disease do not have as favorable a prognosis as previously believed. Their risk factors should be managed as aggressively as someone who has CHD. Cardiac arrhythmias. The normal cardiac rhythm is called “sinus rhythm” and the normal heart rate is 60 to 100 beats per minute. An arrhythmia occurs when the heart beats irregularly or abnormally slow (bradycardia) or fast (tachycardia). While many arrhythmias don’t cause symptoms, some cause chest pain, dizziness, fainting and shortness of breath. Atherosclerosis, angina, valvular heart disease, weakened heart muscle (i.e., cardiomyopathy), blood clots, thyroid abnormalities or heart attack can cause this condition.Medications can help stabilize heart rhythms. Abstaining from caffeine, alcohol and cigarette smoking can also help. Pacemakers are often recommended to correct a slow heart rhythm. Because heart disease and its risk factors can be silent for so long, often with few symptoms until the disease is well under way, it’s important to know your personal risk factors. That includes knowing your family health history and your cholesterol and blood pressure levels. Two major studies published in 2003 found that nearly everyone who dies of heart disease, including heart attacks, had at least one or more of the conventional heart disease risk factors: smoking, diabetes, high blood pressure and high cholesterol. A simple heart disease risk assessment tool based on the Framingham Risk Model can be found online at It estimates your 10-year risk of having a heart attack or dying of coronary heart disease based on your answers to questions about your personal risk factors. Your risk, whether very high, high, moderate or low, determines what steps you should take to reduce that risk, including whether or not you should be put on medication. No matter what your age, if you suspect you have heart disease or are at risk of heart disease, talk to your health care professional about diagnostic stress testing, which is done using the EKG and may also involve echocardiography or nuclear imaging of the heart. Standard cardiac screening is not as accurate at diagnosing women’s heart conditions as it has been for evaluating men’s symptoms. A treadmill or stress test, also known as an exercise ECG (electrocardiogram), records the heart’s electrical impulses under exertion. There are limitations, however, to the accuracy of these tests, including that they may report a blockage where none exists, particularly in young women. Older women may not be able to reach the exercise intensity necessary on the treadmill to detect any restricted blood flow. All testing should be individualized and the best approach may be a combination of tests to evaluate symptoms. For example, in a thallium or sestamibi scan, radioactive substances that can assess blood flow may be used with the treadmill test to improve accuracy. An echocardiogram, which can assess the heart’s pumping function, can also provide a complete profile. Drug alternatives that mimic the stress of exercise may be given to women who aren’t physically able to take a stress test. An ECG (or EKG) is a graphic record of the electrical activity of the heart as it contracts and rests. To record the ECG, a technician positions a number of small contacts on your arms, legs and chest to connect them to an ECG machine. An ECG can detect arrhythmias and heart damage, inadequate blood flow and heart enlargement.For many women with angina, the ECG at rest is normal. This is not surprising because the symptoms of angina occur during stress. Therefore, the functioning of the heart may be tested under stress, typically exercise. In the simplest stress test, the ECG is taken before, during and after exercise to look for stress-related abnormalities. Blood pressure and heart rate are also measured during the stress test and symptoms are noted. An echocardiogram uses ultrasound to evaluate the shape, structure and strength of the heart muscle and detect any areas of weakness that occur during stress (treadmill exercise or drug stress). This test is noninvasive and can be performed during rest and exertion. Nuclear scanning is sometimes used to show damaged areas of the heart and expose problems with the heart’s pumping action. A small amount of a radioactive substance is injected into a vein, usually in the arm. A scanning camera records the nuclear material that is taken up by the heart muscle (healthy areas) or not taken up (damaged areas). An initial test is recorded while resting; a second test while you perform near maximum intensity on the treadmill. After exercise, a scan is taken of the heart muscle, showing areas of decreased blood supply. Coronary angiography is a test used to outline the coronary arteries. A fluid that appears on X-rays (a “contrast medium” or “dye”) is injected through a fine tube (catheter) put into an artery of an arm or leg and passed into the heart. The heart and blood vessels are then filmed while the heart pumps. The picture that results, called an angiogram or arteriogram, shows problems such as a blockage caused by atherosclerosis. This is the most accurate way to assess the presence and severity of coronary disease. High sensitivity C-reactive protein (CRP) blood test. This blood test detects a protein that becomes elevated in response to inflammation, called high-sensitivity (hs) C-reactive protein (CRP). Inflammation is associated with an increased risk of atherosclerosis although it is not clear if it actually causes the disease. Current guidelines from the American Heart Association and the U.S. Centers for Disease Control and Prevention recommend limiting the use of the hs-CRP test as a discretionary tool for evaluating people of moderate risk, and not using it as a means of screening the entire adult population because there is insufficient scientific evidence supporting widespread use at this time. If a heart attack is suspected, doctors will order a blood test and an electrocardiogram (ECG) to test for changes in certain enzymes in the bloodstream and any disruption to the heart’s electrical impulses. One such blood test detects changed levels of troponin, a protein that leaks from the heart muscle when it is damaged. Health care professionals may also check levels of enzymes called creatine kinase to determine if you have had a heart attack or if other muscles in your body have been damaged. Creatine kinase almost always rises in people who have had a heart attack, but levels of the enzyme can also be elevated for other reasons. Your health care professional will most likely perform other tests to exclude other medical conditions. Coronary heart disease (CHD) is treated in a number of ways, depending on its severity. For many women, CHD is managed with lifestyle changes and medications. Others may need more invasive procedures, perhaps even surgery, and medication. In any case, once CHD develops, it requires lifelong management. Smoking. Smoking is the number one preventable cause of CHD. Quitting smoking dramatically and immediately lowers the risk of a heart attack and also reduces the risk of a second heart attack in people who have already had one. Diet. If you don’t smoke, changing your dietary habits is the best way to stop atherosclerosis from progressing to coronary heart disease. Changing your diet to one low in saturated fat, trans fat and cholesterol reduces blood cholesterol, a primary cause of atherosclerosis. Eating less fat should also help you lose weight. The DASH (Dietary Approaches to Stop Hypertension) diet, endorsed by the major heart organizations, is one strategy for lowering high blood pressure. It is rich in lower-calorie foods such as fruits and vegetables,whole grains and low-fat dairy products, as well as being low in sodium.The “Therapeutic Lifestyle Changes (TLC) Diet” plan, developed by the NHLBI, calls for less than seven percent of your calories to come from saturated fat and for less than 200 mg of dietary cholesterol. Twenty-five to 35 percent or fewer of total daily calories can come from fat, provided most of these calories are from unsaturated fat, which doesn’t raise cholesterol. Sodium intake should be limited to no more than 2,400 mg per day. In addition, the guidelines encourage the use of certain foods rich in soluble fiber to boost the diet’s LDL-lowering power.In addition to these low-fat dietary approaches, some large studies also point to the Mediterranean-style diet as an alternative pattern of eating to reduce your risk of heart disease. Like the low-fat diets, the Mediterranean eating pattern focuses on fruits, vegetables, whole grains, nuts and seeds, but it also includes olive oil as a significant source of monounsaturated fat and wine in low to moderate amounts. The major protein sources are dairy, fish and poultry, with minimal red meat.The Mediterranean eating style allows a higher percentage of calories from fat than the low-fat diets typically endorsed by health organizations, but several recent major studies have shown that the diet can lower risk for heart attacks and diabetes and is an alternative to low-fat diets. Exercise. You also can benefit from exercise. Recent research finds that even moderate amounts of physical activity are associated with lower death rates from coronary heart disease. The 2011 AHA Guidelines recommend at least 150 minutes per week of moderate exercise or 75 minutes per week of vigorous exercise or an equivalent combination of moderate- and vigorous-intensity aerobic activity. If you need to lose weight or maintain weight loss, the recommendation rises to 60 to 90 minutes of moderate exercise on most, preferably all, days of the week. However, if you have severe CHD you may have to restrict your exercise somewhat, so check with your health care professional to find out what kinds and amounts of exercise are best for you. Weight loss. If you are overweight, losing weight can help lower blood cholesterol levels. It is also the most effective lifestyle change to reduce high blood pressure and diabetes, which are all risk factors for atherosclerosis and heart disease. The best way to lose weight is through a combination of diet and exercise, emphasizing healthy food choices, portion control and an active lifestyle. In addition to lifestyle changes, medications are prescribed according to the type of CHD you have, how serious it is and other health conditions you may have. The symptoms of angina can generally be controlled by beta blocker drugs that decrease the workload on the heart, by nitrates (including nitroglycerin) that dilate the arteries, by calcium channel blockers (CCBs) that relax the arteries and by other classes of drugs. The tendency to form clots can be reduced by taking aspirin or by other drugs called platelet inhibitory and anticoagulant drugs. Beta blockers and angiotensin converting enzyme inhibitors (ACE), and statins, have also been shown to reduce the risk of recurrent heart attack. Angiotensin converting enzyme (ACE) inhibitors or angiotensin receptor blockers (ARB). These drugs stop production of a chemical that makes blood vessels narrow. They are primarily used to reduce blood pressure and help the heart heal when it has been damaged. There is evidence they may also reduce the risk of having a second heart attack. Research finds that using ACE inhibitors during pregnancy, especially after the first three months, can cause low blood pressure, severe kidney failure, too much potassium or even death in the newborn. Therefore, it is important that you check with your doctor immediately if you are taking these drugs and think you may be pregnant. Aspirin. Low-dose aspirin—up to 325 mg per day—helps prevent heart attacks when taken daily upon the recommendation of a health care professional. Today, the American Heart Association and the U.S. Preventive Services Task Force recommend that people at high risk for heart attack or stroke discuss taking a daily, low-dose aspirin with their health care professionals.However, a study presented at the 2005 American College of Cardiology meeting and published in the New England Journal of Medicine in March 2005 found that low-dose aspirin did not appear to prevent first heart attacks in healthy women younger than 65, although it did significantly reduce their risk of ischemic stroke.So it’s very important that you check with your health care provider about whether or not aspirin therapy is right for you. If you already are taking low-dose aspirin therapy, check with your health care professional before stopping it if you have questions about the study.For women who should be on aspirin therapy, it doesn’t take much to get the benefits. Studies find that between 75 and 100 milligrams, known as “low-dose aspirin therapy,” is enough to reduce the risk for heart attack or angina. Most aspirin brands come in low-dose formulations of 81 mg. The upper dosage for aspirin in women at a high risk for heart disease is 325 milligrams.Aspirin’s cardioprotective benefits stem from its unique ability to interfere with the blood cells that are responsible for forming sticky clots. Aspirin also soothes inflammation in the arteries, which can help protect blockages from developing.Aspirin has a downside, however. Because it acts on the overall system that affects bleeding, aspirin increases the risk of gastrointestinal bleeding, either from an ulcer or gastritis, and the risk of a rare but dangerous form of stroke caused not by a blood clot, but by bleeding in the brain. This fact, and the lack of strong enough evidence to support a change in labeling, led the U.S. Food and Drug Administration panel in December 2003 to vote against including “primary prevention of heart attack” in the indications for use of aspirin on the medication’s label. Anticoagulants (warfarin, dabigatran). These drugs, known by brand names including Coumadin, Jantoven and a new drug called Pradaxa, protect against stroke due to atrial fibrillation (abnormal heart rhythm) by reducing the risk of blood clots. It is also used for some women with other types of heart disease or stroke. Beta blockers. These drugs reduce the heart’s workload and are used for high blood pressure and chest pain and to prevent a repeat heart attack. Statins. Numerous statin drugs are available in the United States including atorvastatin (Lipitor), fluvastatin (Lescol), lovastatin (Mevacor, Altoprev), pravastatin (Pravachol), simvastatin (Zocor), rosuvastatin (Crestor) and pitavastatin (Livalo). In addition, statins are found in the combination medications lovastatin plus niacin (Advicor), atorvastatin plus amlodipine (Caduet) and simvastatin plus ezetimibe (Vytorin).These highly effective drugs typically produce a 20 to 60 percent reduction in LDL cholesterol levels. They also provide the added benefits of some increase in HDL cholesterol, some reduction in triglyceride levels and a decrease in the inflammation in the blood vessel linings that can lead to CHD. Make sure you talk about any potential side effects from statins with your health care provider. If you start to experience any side effects such as muscle aches or dark urine, stop taking the drug immediately and call your health care professional. Nicotinic acid. More commonly known as niacin, this compound is a water-soluble B vitamin. Unfortunately, you can’t lower your cholesterol by taking a vitamin supplement; to have such an effect, it must be taken in doses well above the daily vitamin requirement. Although nicotinic acid is inexpensive and available over the counter, never take it to lower your cholesterol without guidance from a health care professional because of potential side effects, especially on the liver. The extended release form is available by prescription as Niaspan and may have less flushing side effect than the shorter-acting version. Niacin has broadly positive effects on cholesterol, lowering LDL cholesterol and triglycerides and raising HDL cholesterol. Fibrates. These drugs work by reducing triglycerides and raising HDL cholesterol. Fibrate medications include gemfibrozil (Lopid), fenofibrate (TriCor) and clofibrate (Atromid-S). Fibrates are not recommended as the sole drug therapy for women with heart disease for whom LDL cholesterol reduction is the main goal. They may be useful in patients who have achieved their LDL goal, but have “residual risk” due to elevated triglycerides or low HDL. Calcium-channel blockers. These drugs reduce the heart’s pumping strength and relax blood vessels. They are used for high blood pressure and chest pain. Digitalis. This drug makes the heart contract harder. It’s used when the heart’s pumping function is weak and to slow some fast heart rhythms. If you are taken to the hospital with a heart attack, thrombolytic (clot dissolving) medications, such as streptokinase and tissue plasminogen activator (tPA), may be injected to restore blood flow, but they should be administered within three to six hours, before extensive damage has occurred. Ideally, urgent treatment with coronary angioplasty and stents may also be performed. The sooner you get to a hospital for treatment, the better the chances are of preventing extensive damage to the heart. Strictly speaking, angioplasty is not surgery. It is done while you are awake, although most often sedated, and may require one to two hours. If angioplasty does not widen the artery, if there are too many artery narrowings or if complications occur, bypass surgery may be needed. One continuing challenge cardiologists face in treating atherosclerosis is that plaque deposits may return (a condition referred to as restenosis). Even people who’ve had angioplasties sometimes require future treatments to widen arteries clogged with new blockage. Today, drug-coated (drug-eluting) stents markedly decrease the rates of restenosis compared to the older generation of stents—called bare-metal stents. The FDA considers both types of stents to be safe and effective in most people. However, all stents involve some risk, and the drug-eluting stents appear to come with a slightly increased risk of blood clots when compared with bare-metal stents. Drug-eluting stents are better at preventing restenosis, but patients who receive these types of stents need to be on the antiplatelet medications, including aspirin and stronger drugs such as Plavix, just before and for at least a year after the stent can has been put in place. Therefore, bare-metal stents may be a better choice for you if you can’t take antiplatelet medication long-term due to an upcoming scheduled surgery or an increased risk of bleeding problems; with bare-metal stents, you just have to take the antiplatelet medications for about a month. Overall, stents are one of the best treatments for heart attack and unstable angina, but medicines and good control of risk factors can be just as effective in certain situations, particularly if your condition is not an emergency. Discuss all your options with your doctor. Coronary artery bypass. During this procedure, a blood vessel, usually taken from the leg, arm or chest, is grafted from the aorta onto the blocked artery, bypassing the blocked area. If more than one artery is blocked, several bypasses can be performed. This enables the blood to go around the obstruction and supply the heart with enough blood to relieve chest pain and prevent a heart attack. Bypass surgery relieves symptoms of heart disease but does not cure it. You will typically need to take medications and make changes in your lifestyle after the operation. Quit smoking. Women who smoke are two to six times as likely to suffer a heart attack as nonsmoking women, and the risk increases with the number of cigarettes smoked per day. Smokers who have a heart attack are more likely to die and die suddenly (within an hour) than are nonsmokers. Cigarette smoking also acts with other risk factors to greatly increase the risk for coronary heart disease. Constant exposure to other people’s smoke—called environmental tobacco smoke, secondhand smoke or passive smoking—increases the risk of heart disease even for nonsmokers. And, of course, smoking also increases your risk for developing lung and other cancers.The good news is that quitting dramatically cuts the risk to your heart, even during the first year, no matter what your age. Even if you’ve had a heart attack, you’ll benefit from quitting—some women’s risk of having a second heart attack is cut by 50 percent or more after they stop smoking. The 2011 guidelines recommend that women use nicotine replacement or other forms of pharmacotherapy in conjunction with a behavioral program or other formal smoking cessation program to help them quit. Lower your blood pressure. Even slightly high blood pressure levels can double your risk for coronary heart disease. High blood pressure also increases your chance of stroke, congestive heart failure and kidney disease. The higher the pressure, the higher the risk. According to the American Heart Association, about one in three Americans age 20 and older have hypertension, and nearly half are women. Until age 45, a higher percentage of men have high blood pressure. From age 45 to 64, rates are about equal between men and women. After that, a much higher percentage of women have high blood pressure than men. High blood pressure is more common and more severe in African-American women. Unfortunately, even in women who are aware of a diagnosis of hypertension, a large number do not have their blood pressure controlled to desirable levels.Blood pressure is considered high when it stays at or above 140/90 mm Hg over a period of time, but you are considered at risk for hypertension if you haveprehypertension, which means your blood pressure is between 120/80 and 139/89 mm Hg.You should have your blood pressure checked whenever you visit a health care professional. At minimum, every two years for women over age 20; more frequently if borderline-high or high blood pressure is indicated or if you have a family history of high blood pressure. Because blood pressure is so variable, it should be checked on several different days before a high blood pressure diagnosis is made.The AHA prevention guidelines for women recommend drug therapy when blood pressure is 140/90 or above. Drug therapy is recommended at even lower blood pressure levels if you have blood-pressure related organ damage or diabetes.If your blood pressure is only mildly elevated, you may be able to control it entirely through weight loss (if you are overweight), regular physical activity, eating a variety of fresh fruits and vegetables and low-fat dairy products and cutting down on alcohol, fat and salt or sodium. Sodium is an ingredient found in many packaged foods, carbonated beverages, baking soda and some antacids. You can reduce the sodium in your diet by limiting the amount of table salt you add to your food; avoiding canned vegetables and using fresh or frozen vegetables instead; and checking food labels for sodium content.Using birth control pills may increase blood pressure in some women. Lower your blood cholesterol level. Today, nearly half of women age 20 and older need to lower their blood cholesterol and nearly one in five American women have blood cholesterol levels high enough to pose a serious risk for CHD. Cholesterol management guidelines issued by the National Cholesterol Education Program (NCEP), a division of the National Heart, Lung, and Blood Institute (NHLBI), specifically zero in on reducing LDL cholesterol levels in adults. Elevated low-density lipoprotein (LDL) cholesterol is a major cause of coronary heart disease.Starting at age 20, all women should have their blood cholesterol tested, with repeat testing every five years, according to the most recent NHLBI guidelines. If you have a health condition or are considered at risk for developing heart disease, your health care professional may recommend cholesterol testing more frequently.Cholesterol testing is recommended for children age two or older if their parents or grandparents had heart disease or vascular disease before age 55 or if at least one of their parents has a cholesterol level of 240 mg/dL or higher.For most people, cutting back on foods high in saturated and trans fat and cholesterol will lower both total and LDL cholesterol.Both the AHA and the National Cholesterol Education Program offer specially designed cholesterol-lowering diets. Ask your health care professional for more information or visit their Web sites: www.heart.org and www.nhlbi.nih.gov.Regular physical activity and weight loss for overweight persons also will lower blood cholesterol levels. Losing extra weight, quitting smoking and becoming more physically active may help boost your HDL cholesterol levels. Lose weight. Overweight women are much more likely to develop heart-related problems, even if they have no other risk factors. Excess body weight in women is linked with coronary heart disease, stroke, congestive heart failure and death from heart-related causes. The more overweight you are, the higher your risk for heart disease. Being overweight contributes not only to cardiovascular diseases, but also to other risk factors, including high blood pressure, high blood cholesterol and diabetes. Fortunately, these conditions often can be controlled with weight loss and regular physical activity.Body shape as well as weight may affect heart health. “Apple-shaped” individuals with extra fat at the waistline may have a higher risk than “pear-shaped” people with heavy hips and thighs. If your waist is nearly as large as, or larger than, the size of your hips, you may have a higher risk for coronary heart disease.Ideally, the AHA preventive guidelines for women recommend women maintain/achieve a body mass index (BMI) between 18.5 and 24.9 and a waist circumference of less than 35 inches. Your BMI, a measurement that considers height as well as weight.For lasting weight loss, engage in regular, brisk physical activity and eat foods that are low in calories and fat. For physical activity, the current recommendations for women who need to lose weight and maintain weight loss are for 60 to 90 minutes of moderate exercise (such as brisk walking) most, preferably all, days of the week. Do not try to lose more than one half to one pound a week.Adjust your diet to include a wide variety of low-calorie, nutritious foods in moderate amounts from the basic food groups. Include pasta, rice, bread and other whole-grain foods, as well as fruits and vegetables, and keep other foods low in fat, since fat is the richest source of calories. But keep in mind that while many low–saturated-fat food products are now available, many of them are still loaded with sugar and therefore high in calories. Go slow. Before each session, take five minutes for stretching and slow movement to warm up, and at the end of the session, take five minutes to cool down with a slower pace. Keep at it. Unless you have to stop your exercise program for health reasons, stick with it. If you feel like giving up because you think you’re not going as fast or as far as you should, set smaller, short-term goals. If you’re getting bored, try engaging in an activity with a friend or switch to another activity. Be aware of diabetes. Diabetes, or high blood sugar, is a serious metabolic disorder that raises the risk of coronary heart disease. According to NHLBI, diabetes poses as great a risk for having a heart attack in 10 years as heart disease itself. Women with diabetes are also more apt to have high blood pressure and high blood cholesterol. About 75 percent of those with diabetes die of some type of cardiovascular disease. Of the estimated 17.2 million Americans with diagnosed diabetes, about 9.3 million are women. In 2006, diabetes killed 36,443 women, representing half of the deaths from the disease.People with diabetes often have accelerated atherosclerosis, or a buildup of plaque in their arteries, meaning they develop the condition faster than those without diabetes who have other similar risk factors.Women with diabetes often aren’t aware of their significantly increased risk for heart disease. In fact, an American Diabetes Association survey found that 68 percent of those with diabetes were not aware of their increased risk for heart disease and stroke, and 60 percent didn’t know they were at risk for high blood pressure and cholesterol, both of which increase their overall risk of heart disease and stroke.While there is no cure for diabetes, it can be controlled. The most important first step is getting the right diagnosis. If you have diabetes, you should be treated as intensively as people with heart disease in terms of medication and lifestyle changes, according to NHLBI.In addition, the American Diabetes Association recommends that people who have diabetes coupled with established cardiovascular disease take a statin daily. They also recommend statins for any person with diabetes over 40 years old who has one or more risk factors for cardiovascular disease, such as high blood pressure.This recommendation is supported by results of a 2008 study published in The Lancet. Researchers looked at 14 previous randomized studies conducted on 19,000 people with diabetes and found that statins cut fatal cardiovascular events such as stroke, heart attack or coronary revascularization by a third for people with diabetes. More specifically, according to the study, statins reduce the risk of a major cardiovascular event by 20 percent for every 40 mg/dL they lower cholesterol.Additionally, tight control of your diabetes is important. The AHA preventive guidelines for women recommend that lifestyle and medication be used to achieve near normal HbA1C levels (less than seven percent). HbA1C is a blood test that provides a picture of blood sugar levels over time. And people with diabetes should work with their health care professionals to get their blood pressure under 130/80. Finally, if you take birth control pills and have diabetes or insulin resistance, you should have regular blood sugar tests because contraceptive hormones can alter glucose levels. Decrease stress. In recent years, we have heard a lot about the connection between stress and heart disease. Some common ways of coping with stress, such as overeating, heavy drinking and smoking, are clearly bad for your heart. Studies continue to investigate the direct effects of stress on your heart.The good news is that sensible health habits can have a protective effect. Regular physical activity not only relieves stress, but also can directly lower your risk of heart disease. Also, participating in a stress management program following a heart attack lowers the chances of further heart-related problems. Follow a heart healthy diet. Avoiding or limiting saturated fat and cholesterol from the foods you eat can help lower cholesterol and reduce the calories contributed to your diet by fat. The “Therapeutic Lifestyle Changes (TLC) Diet” plan, developed by the NHLBI, calls for less than seven percent of your calories to come from saturated fat and for less than 200 mg of dietary cholesterol.Twenty-five to 35 percent or fewer of total daily calories can come from fat, provided most of these calories are from unsaturated fat, which doesn’t raise cholesterol.Also limit your sodium intake to no more than 2,400 mg per day.The guidelines encourage the use of certain foods rich in soluble fiber to boost the diet’s LDL-lowering power. In addition, the AHA recommends women limit their intake of trans fatty acids overall.Because some women have trouble following a low-fat diet, many experts now give their patients a choice of a low-fat diet or the Mediterranean-style diet, which also emphasizes eating fruits, vegetables and whole grains, but includes a higher percentage of unsaturated fats, primarily from the monounsaturated fat found in olive oil. Saturated fats are low in the Mediterranean-style diet.Saturated fat is found mainly in food that comes from animals. Whole milk dairy products such as butter, cheese, milk, cream and ice cream all contain high amounts of saturated fat. The fat in meat and poultry skin is also loaded with saturated fat. A few vegetable fats—coconut oil, cocoa butter, palm kernel oil and palm oil—are also high in saturated fat. These fats are sometimes found in cookies, crackers, coffee creamers, whipped toppings and snack foods. Remember: Saturated fat boosts your blood cholesterol level more than anything else in your diet.While unsaturated fat does not raise cholesterol levels, like all fats it has nine calories per gram. Polyunsaturated fat (found in many cooking and salad oils, such as safflower, corn, soybean, cottonseed, sesame and sunflower oils, and in some margarine) and monounsaturated fat (found in olive, canola and peanut oils) are examples of unsaturated fats. Foods that contribute cholesterol to your diet come from animal sources. Egg yolks and organ meats (liver, for example) are very high in cholesterol. Meat and poultry have similar amounts of cholesterol. Eating less cholesterol will help lower blood cholesterol level. In addition to the above recommendations, the AHA recommends that women with high cholesterol and/or high triglycerides include plenty of omega-3 fatty acids in their diets. Women can get omega-3 fatty acids by eating two servings of fatty fish, such as tuna, mackerel or salmon, per week, as well as taking fish oil supplements. Eat a balanced diet with fish two to three times a week, if possible. Instead of whole milk or cream, drink skim or one percent milk. Try nonfat or low-fat yogurt in place of sour cream. Use nonfat or low-fat cheeses. Substitute sherbet and nonfat or low-fat frozen yogurt for ice cream. Eat egg yolks only in moderation. Egg whites contain no fat or cholesterol and can be eaten often. In most recipes, substitute two egg whites for one whole egg. Eat plenty of fruits and vegetables as well as cereals, breads, rice and pasta made from whole grains (for example, rye bread, whole wheat spaghetti and bran cereal). These foods are good sources of starch and fiber, and usually contain no cholesterol and little or no saturated fat. Liquid vegetable oils are a good choice for sautéing vegetables, browning potatoes, popping corn and making baked goods, pancakes and waffles. Use small amounts or try a vegetable oil cooking spray. Eat plant stanol and sterol margarines. Plant sterols (also called stanol esters), work by blocking absorption of cholesterol in the digestive tract. Recent studies have shown that plant sterols effectively lower cholesterol even in people already on statin medications. Although name brands are not specifically mentioned, the American Association of Clinical Endocrinologists (AACE) lipid guidelines recognize plant stanol esters, like those found in Benecol and Take Control spreads, as effective dietary agents for lowering LDL or bad cholesterol by more than 10 percent. To get this effect, however, you have to “take” the full amount daily (at least 2 grams a day, equivalent to 2 to 4 tablespoons), not just once in a while. Cardiac rehabilitation. Women who have recently had a heart attack, or a coronary intervention such as angioplasty or bypass surgery, should participate in some form of cardiac rehabilitation. Cardiac rehabilitation is a medically supervised program to help heart patients recover quickly and improve their overall physical and mental functioning. The goal is to reduce the risk of another cardiac event or to keep an already present heart condition from getting worse. Programs include counseling, exercise, help with identifying and modifying risk factors and returning to work, as well as lending emotional support.However, several studies find that women are underrepresented in such programs and do not get referred as often as men, even though the results are just as good for women as for men. Alcohol use. If you drink, do so in moderation. This means one drink per day and for men, two drinks per day. One drink equals 12 ounces of beer, five ounces of wine, or one and one-half ounces of 80-proof liquor.If you are a nondrinker, this is not a recommendation to start using alcohol. And certainly, if you are pregnant or have another health condition that could make alcohol use harmful, you should not drink.Remember, moderation is the key. More than two drinks per day can raise blood pressure, and binge drinking can lead to stroke. People who drink heavily on a regular basis have higher rates of heart disease than either moderate drinkers or nondrinkers. Aspirin. The research on aspirin is promising. Aspirin may help to both prevent heart attacks in older healthy women and treat heart attacks in women who have already had them.Aspirin also reduces the chances that women who have already had a heart attack or stroke will have, or die from, another one. If taken quickly, aspirin may also increase the chances of survival after a heart attack. The AHA guidelines for women recommend that women who are at high risk of coronary heart disease take a daily aspirin (or clopidogrel, brand name Plavix, if they can’t take aspirin). Discuss this option with your doctor. In addition, the AHA 2011 updated guidelines for women state that routine low-dose aspirin therapy may be considered in women age 65 or older, regardless of their risk of cardiovascular disease, if blood pressure is controlled and the benefit for ischemic stroke and heart attack prevention is likely to outweigh the risk of gastrointestinal bleeding or hemorrhagic stroke.Keep in mind, however, that aspirin is a powerful drug with many side effects. It can increase your chances of getting ulcers, kidney disease, liver disease and a stroke from a hemorrhage. Because of these serious risks, you should not take aspirin to either prevent or treat a heart attack without first discussing it with your health care professional. Omega-3 fatty acids. More and more research suggests that consuming fish and fish oil supplements (omega-3 fatty acids) can lower the risk of CHD and death from CHD. In fact, the AHA recommends that women with high cholesterol and/or high triglycerides supplement their diet with omega-3 fatty acids. Women can get omega-3 fatty acids by eating two servings of fatty fish, such as tuna, mackerel or salmon, per week, as well as taking fish oil supplements. Women with documented heart disease should consume about 1 gram of eicosapentaenoic acid (EPA) and docosahexaenoic acid (DHA) per day, preferably from oily fish. However, EPA and DHA supplements may be considered after they have cleared them with their health care professionals. Women with elevated triglycerides may need 2 to 4 grams of EPA and DHA per day provided in supplements under the care of a health care professional.Despite past warnings about seafood and mercury content, a report released by the Institute of Medicine (IOM) showed that the heart benefits of seafood outweigh the risks in infants as well as in adults. As a result, they recommend that women eat at least two servings of fatty fish per week. Pregnant women, however, should avoid eating fish with the potential for the highest levels of mercury, including shark, swordfish, king mackerel and tile fish. Omega-6 fatty acids. A 2009 advisory from the American Heart Association recommends getting at least 5 to 10 percent of daily caloric intake from omega-6 fatty acids as part of a low-saturated-fat, low-cholesterol diet. An analysis of recent research shows that such consumption slightly reduces the risk of coronary heart disease risk. Omega-6 fatty acids come primarily from vegetable oils, nuts and seeds. The average American typically gets about 6 percent of daily calories from omega-6 fatty acids from such things as nuts, cooking oils and salad dressings, according to the AHA report. To find foods containing omega-6, look for polyunsaturated fat on a product’s nutrition label. Recommended daily servings of omega-6 depend on physical activity level, age and gender, but range from 12 to 22 grams per day. The AHA reports that 23 percent of women age 40 and older will die within a year of a heart attack, compared with only 18 percent of men. Coronary heart disease is a disease of the heart’s blood vessels that, if untreated, can cause heart attacks. Like any muscle, the heart needs a constant supply of oxygen and nutrients, which are carried to it by the blood in the coronary arteries. When the coronary arteries become narrowed or clogged and cannot supply enough blood to the heart, CHD results. Menopausal hormone therapy—also known as hormone replacement therapy—once was prescribed for preventing heart disease in addition to treating menopausal symptoms such as hot flashes. But, findings from the Women’s Health Initiative suggest that some forms of menopausal hormone therapy increase a woman’s risk of cardiovascular disease, especially if started long after the menopause has onset, rather than prevent it. Currently, health experts recommend against prescribing hormone therapy for prevention of heart disease. However, there does not appear to be any increased risk for developing CHD, if hormone therapy is started early on in menopause for very bothersome menopausal symptoms, such as hot flashes. Smoking is one of the four major risk factors for coronary artery disease. Women who smoke are two to six times more likely to suffer a heart attack than nonsmoking women, and the risk increases with the number of cigarettes smoked per day. Smokers who have a heart attack are more likely to die and die suddenly (within an hour) than are nonsmokers. Cigarette smoking also acts with other risk factors to greatly increase the risk for coronary heart disease, such as atherosclerosis (“hardening of the arteries”). Today, nearly half of women age 20 and older need to lower their blood cholesterol, and nearly one in five American women have blood cholesterol levels high enough to pose a serious risk for CHD. Overweight women are much more likely to develop heart-related problems than women who aren’t. Obesity is linked with coronary heart disease, stroke, congestive heart failure and death from heart-related causes. The more overweight you are, the higher your risk for heart disease. What’s the difference between angina and a heart attack?An episode of angina is not a heart attack. When blood flow to the heart is reduced, chest pain, or angina, can result. If blood flow is nearly or completely blocked, a heart attack can occur, killing muscle cells in the heart. Angina usually disappears with rest or medicine, such as nitroglycerin, while a heart attack requires much more intensive therapy in a hospital. If the pain is severe or doesn’t go away, or if the symptoms are those of a heart attack, call 911 and get evaluated at a nearby hospital emergency room. I’ve been smoking for a long time—isn’t it too late to quit?The good news is that quitting dramatically cuts the risk to your heart, even during the first year, no matter what your age or how long you’ve been smoking. Even if you’ve had a heart attack, you’ll benefit from quitting—estimates suggest that a woman’s risk of having a second heart attack is cut by 50 percent or more after she stops smoking. Recent AHA guidelines recommend counseling, nicotine replacement and other forms of therapy to help women stop smoking. What’s the connection between estrogen and heart disease?Prior to menopause, naturally circulating estrogen in a woman’s body may help keep her arteries free from atherosclerotic plaque (the buildup of fatty substances, cholesterol, cellular waste and other material) by improving the ratio of LDL (low-density lipoprotein) and HDL (high-density lipoprotein) cholesterol. Estrogen increases the amount of HDL cholesterol, which helps to clear the arteries of LDL cholesterol—the kind that contributes to plaque. Estrogen also helps keep the lining of blood vessels strong and pliable. Do birth control pills cause cardiovascular problems?Oral contraceptives used to have much higher doses of estrogen than they do today. Such pills increased the risk of vascular and heart disease, especially among women who smoked. American women today typically use pills that have 35 micrograms of estrogen or less. There is a small risk of heart disease for premenopausal women using a pill that has up to 50 micrograms of estrogen. However, even the lower-dose pills carry a risk of increasing blood pressure, and if you have any cardiovascular symptoms or conditions, or if you have diabetes or insulin resistance, be sure to discuss those conditions with a health care professional before starting the medication. Also make sure your health care professional knows if you smoke. Even with the low-dose pill, smoking boosts the risks of serious cardiovascular problems, particularly in women over 35. Bottom line: You should not smoke and take birth control pills. What foods are unhealthy for my heart?Avoiding saturated fat and cholesterol is important in a heart-healthy diet, especially if you already have heart disease. Saturated fat is found mainly in food that comes from animals. Whole-milk dairy products such as butter, cheese, milk, cream and ice cream all contain high amounts of saturated fat. The fat in meat and poultry skin is also loaded with saturated fat. A few vegetable fats—coconut oil, cocoa butter, palm kernel oil and palm oil—are high in saturated fat. Cholesterol is found only in foods that come from animals. Egg yolks and organ meats (liver, for example) are very high in cholesterol. Meat and poultry have similar amounts of cholesterol. Try to eat more complex carbohydrates (especially from whole grain sources), vegetables and fruits, with only very small amounts of fat. What’s the difference between “good” and “bad” cholesterol?Cholesterol travels in the blood in packages called lipoproteins. Cholesterol packaged in low-density lipoprotein (LDL) is often called “bad” cholesterol, because too much LDL in the blood can lead to cholesterol buildup and blockage in the arteries. In fact, lowering LDL cholesterol is a major goal of cholesterol management guidelines issued by the National Heart, Lung, and Blood Institute, a division of the National Institutes of Health. Another type of cholesterol, which is packaged in high-density lipoprotein (HDL), is known as “good” cholesterol. That is because HDL helps remove cholesterol from the blood, preventing it from piling up in the arteries. You should aim for low levels of LDL and high levels of HDL. I’m under 40. Should I be concerned about heart disease?Yes, because the lifestyle you lead now may be contributing to atherosclerotic buildup in your arteries—the beginning of coronary heart disease. All women over the age of 20 should have their blood cholesterol tested every five years and their blood pressure checked every one to two years. Blood pressure is usually checked every time you visit a health care professional. Isn’t exercise dangerous for those with coronary heart disease?While physical activity can strengthen your heart and is recommended even for those who have had a heart attack, some types of activity may worsen existing heart problems. Warning signals include sudden dizziness, cold sweat, paleness, fainting or pain or pressure in your upper body during or after engaging in physical activity. If you notice any of these signs, call your health care professional and/or 911 immediately, and be sure to check with your health care professional before starting an exercise plan if you have a heart condition. Isn’t heart disease dictated by genes?A family history of heart disease is indeed a risk factor for heart disease, but it plays a smaller role than the risk factors you can control—smoking, diabetes, weight, activity levels, blood pressure and cholesterol levels. What Foods are Best for the heart Health?